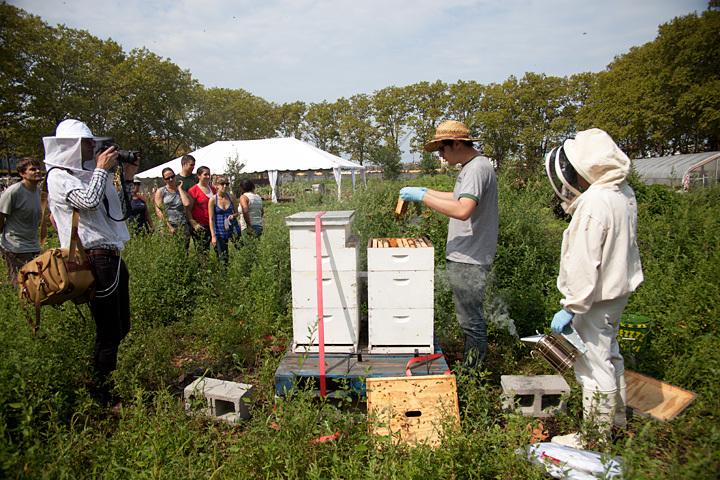 This weekend there are many ways for you to come and visit me and my bees in Brooklyn! Because it is my birthday this week, I am mixing things up and taking Friday off to host a FREE Public Hive Inspection at the Added Value Community Farm in Red Hook, Brooklyn. Hint: It's across the street from IKEA. Getchu some meatballs in your face and getchu some bees in your hands. It's what we call a win-win situation in my business. This week's inspection is going to be particularly exciting. If you have read Part One and Part Two of Queenright in Red Hook and would like to skip ahead and see the (hopefully) awesome conclusion of the saga, COME OUT TO RED HOOK on FRIDAY, SEPTEMBER 30th. I won't know the ending either, and I wasn't able to do it last week because of the damn rain, so I'm SUPER STOKED to find out! I'll be there bright and early, rip-roarin' to go, and I'll start the talk and demo at 11AM or SOON THEREAFTER. Be on time! Get there early! Get your hands dirty on the farm! The demo will take place during open volunteer hours, so stick around afterwards! YES! P.S. DID I MENTION THAT IT'S FREE!? It's all going down at the Added Value Red Hook Community Farm, located at 3-49 Halleck St, Brooklyn, 11231, and I'll be starting the inspection at 11AM. A/C/F train to Jay Street/Borough Hall. Exit the station and walk west to Boerum Place and Joralemon Street. Take the B61 bus going towards Red Hook. Exit the bus at the IKEA store, and the farm is across the street. R to 4th Ave/9th St. Take the B61 bus going towards Red Hook/IKEA on 9th st. Exit the bus at the IKEA store, and the farm is across the street. I will be manning a table at the New New York Green Block Party in Williamsburg, this Saturday, October 1st. I'm going to have live bees with me in my observation hive, lots of free fliers with basic bee facts, and a whole bunch of time on my hands to answer all your most burning beekeeping questions. Join us Saturday, October 1 from 11am to 5pm on North 11th St (Wythe/Berry) in Williamsburg for a green block party with vendors, tours, food, and fun! Attending the fair, and many of our extra activities, is free. We are also hosting an After Party (34 Berry parking lot) complete with beer and a screening of a urban agriculture documentary followed by a Hollywood blockbuster. Check out the schedule for more info. The NEW New York is GreenHomeNYC’s revolutionary interpretation of the typical New York block party. Street fairs and block parties are an intrinsic part of the New York City summer experience, bringing neighborhoods together, culture to the streets, celebrations and joy to the public spaces of our city. The NEW New York re-invents this tradition to bring home — right to the front stoop — ideas for greening our built environment for the residents of the city. A core component of the event is to use the streetscape and surroundings as a “classroom.” In addition to leaving behind a block transformed with examples of a greener city, such as a newly planted tree, activities will be tied into the immediate environs, such as tours of a nearby green building. The day’s activities will be multifaceted, incorporating educational workshops covering a wide array of topics, hands-on demonstrations by exhibitors, and, tours of green buildings, companies, and local natural resources. Activities will benefit anyone on the green spectrum from curious to committed, including youth. The event will take place annually each autumn and occupy one street block. Last year we took over Third Street between Bond and Hoyt in the Carroll Gardens / Gowanus Canal neighborhood of Brooklyn. This year we are in Williamsburg on N 11th Street at Wythe — in front of Brooklyn Brewery and around the corner from Brooklyn Bowl! Perhaps next year we will be in your neighborhood! I had a lot of fun doing this last year and really enjoyed talking to y'all. Come out again and ask more questions! I like it! P.S. If something else is burning, you should see your doctor. P.P.S. Please don't show it to me. I am not your doctor.